Talkin' Chow Playin' House: Goood Morning 100th Post!...and a Giveaway. Goood Morning 100th Post!...and a Giveaway. 100th post!? Kara and I love this little blog, but the cherry on top, the icing on the cake, is all of YOU. You, dear friends, is what makes this blog. Thanks so much for all your love and support....and for actually trying the RECIPES! It makes our days when we hear about you making things and enjoying them....you guys are the best! To celebrate this moment and all of you, we are doing a giveaway! We are giving away a Rollpat and our most FAVORITE Baking cookbook to go with it. Not sure what a Rollpat is? 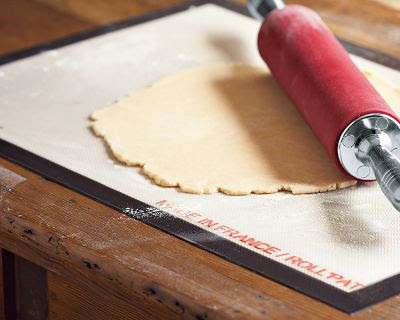 It's a non-stick silicone surface that allows for ideal rolling of pastry and cookie doughs, and kneading and shaping bread or pizza doughs. No more worries about flouring work surfaces and your dough tearing....this thing takes all that stress away. I LOVE mine and it has changed my life in the kitchen. Pie baking season is coming up and this'll surely be your best friend. To enter, all you need to do is become a FOLLOWER and LEAVE A COMMENT! If you're already a follower then just leave a comment and you'll be entered. We'll pick a winner and announce it a week from today- Wednesday, Sept. 15. P.S. We wish you all could win. Seriously, this is the blog that I PRAY my children never find out about :). I don't want them to know that there are mommies out there who cook amazing meals like these or their families. hahaha. Totally kidding! I am inspired by this blog more and more with every new post! Thank you ladies. I love it! love your blog and have tried a few of these recipes. they're awesome! i'm a follower. I'm thinking about getting a house in The Hamptons...just because I think it's funny when people talk about "The Hamptons" in a smarmy voice, and I would like to be one of them. You know I love everything you do, Bri! Brigham is all over that hotdog with onions recipe, btw. I didn't know you had this blog bri...I am your newest follower! p.s. don't you love all of haley's comments?? I do! No matter what they say....I'm your biggest fan! haha hehe I love you guys and this blog is going to be on all the top food blog lists VERY soon! Best of luck, and keep it coming!! It's official...I'm a follower! There's nothing I love more than giveaways! your blog is the best!! I especially love the desserts! I would love to be the blog taste tester! i love that you are doing this. i have read them all. it is nice to see you guys do something fun together and take such care of your families. Oh girls! I just adore you! Love the blog. I want to try every single one of these recipes! Awesome!! Ok, the Rollpat WILL change my life! I am always struggling when I make any kind of dough as to where I will roll it out. I need to get me one of those for sure!! Hope you're doing well! Oooh, pick me! Pick me!! Seriously, your recipes have saved my bacon on more than one occassion. Keep em' coming!! I WANT IT!!! I LOVE your blog too! The white chicken enchiladas are Bryce's new favorite! Thanks for sharing all your awesome recipes! Thanks for a fun place to come get new recipes! just pick me, you know you want to :) what a fun blog! brooke just introduced me to it. hey, better late than never, right? I have become an addict of the Norstrom salad dressing. Thanks for the recipe!!! I love your blog you guys!! Elliot has picked a few recipes that I Need to make him :) Kara I have a question/favor to ask you... I have fallen in LOVE with the oatmeal cookie and Sweet Tooth Fairy, so I am trying to re-create it at home. I have found an oatmeal cookie recipe that I like, but now I am stuck on the frosting. Next time i go there if I buy you one can you help me out? 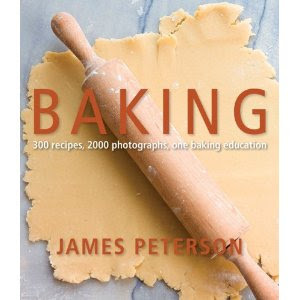 I wish we all could win too, :) that baking book looks amazing. Just keep on posting all the salivating photos and recipes and I'm a happy gal! Thanks for always sharing such great recipes and tips. Can't wait to see who wins. So much fun.. Love your blog! Great giveaway! I love this blog! I love how dependable EVERY recipe is. I know anything I try will be amazing.I also love how you do all the work and I just get to get on and find the recipe. Thanks for all you do! Your blog is heavenly! Melanie Gray is my sister-in-law and raved about it, so I gave it a try. I've made the Baby Stawberry Shortcakes (which were the hit of my party), the Toasted Mallow-Caramel Cookies, Blueberry Muffins, and bake the Sunday Cookies on a weekly basis. I get so many compliments on everything I make from your blog! I send everyone the link. Thank you for all of your cooking skills and for taking the time to share them! I know if it's from your blog, it will be good. I am a dedicated follower! I love this blog! Whenever I have to make anything I turn here for inspiration! THANK YOU!! I recently found your blog and love all your yummy recipes! Oh and I am now a follower! Hi! I used to work with Melanie Gray and found your blog. I love it! I've made the blueberry muffins (best recipe I've found for them), the peanut butter chocolate bars, the vanilla cake, Sunday cookies (every week) and some others. Everything is sooo good! Would love to win that book! Thanks for the great blog! Fun to keep an eye on ya girls! Thanks for sharing! Love your blog, recipes, and you girls.